There was this wonderful scene near the finale of the 1988 film "Working Girl". A Wall Street kingpin asked a question to the movie's heroine played by Melanie Griffith. The question was where did the idea for the merger come from? What was the initial creative spark that set the machinations of her mind in motion to create the deal.? Melanie's character had an instant and detailed answer to his question while Melanie's rival, played with sinister glee by Sigourney Weaver, stammered and the Wall Street kingpin knew that Melanie spoke the truth and the idea was hers and had been stolen by her insidious rival. All creative projects be they paintings, novels, movies, songs or even Wall Street mergers have that initial gestation period ignited by a spark of an idea that sets off a train of thought in motion. Sometimes it is real life people and events, sometimes a just feeling or mood and sometimes it may be simply another creative work that inspires a homage. Often it is an uneven mix of all of the above. Everything I create as a writer is personal. It has to be to keep me interested and passionate enough to do the work and unleash it on the world. Even a pure genre work must have the stamp of someone's personality to give it a soul and infuse it with life. For me sometimes the initial creative spark is about a philosophy and a fascination with our evolutionary prehistoric past as in the Bull Mongoni books. Sometimes a deeply personal story woven into the format of a thriller as in "She". And sometimes it is like "Action Figure". "It's all about who you know. It's all about who is the best bold-faced liar. It's all about listening to your instinct when it screams run." Meet Wes Jackson. A burned out shell of a man leading a life of quiet desperation. Then one day, he has a fateful encounter with two security guard goons. The confrontation escalates and turns deadly, and now Wes Jackson is a man on the run. He is a hunted man-a man who has been reborn and re-invented. And a man who is determined to succeed in his dark journey of escape, no matter who or what stands in his way. The "fateful encounter with two security guard goons" is based on something that actually happened to me. I had just received some bad news and was on my way to the airport to catch a flight home to be at someone's deathbed. It was early on a Sunday morning and I had few hours until boarding began so I decided to stop at a Border's bookstore on the way to get a some coffee and pick up a book. There must have been an event of some kind going on because the Border's parking lot was packed. So I pulled into the end of the Galleria Mall parking lot (the mall had not opened yet) thinking I would walk across the street, get a coffee, pick up a book and head off to the airport. The second I pulled into the Mall parking lot, I was descended upon by two fascist, moronic goons just as Wes Jackson is in "Action Figure". It pretty much went down as described in the book. Well, up to point anyway. I did not end up a fugitive on the run and could not risk getting arrested. I had to get to the airport so I did have time to deal with those inbred bullies or hassle with the cop who soon arrived on the scene. I was forced to cower and stand down so that I could be on my way. See, I have this character flaw, kind of like Marty McFly in "Back to the Future II". I can never back down. If someone challenges me, tries to humiliate or intimidate me, I will fight them to the death and god help anyone who dares to stand in my way. In the cold, rational logic of reasonable thought that sounds like foolish machismo bordering on psychotic. And it is actually frightening to witness (so I am told). Thankfully, I am still alive (so far) to use such exploits for exploitation purposes in my story telling fervor. The barbaric rage inside me from that mall parking lot incident did not die and I thought about that encounter every day for many years afterward. I put it together with several other confrontations from my past. 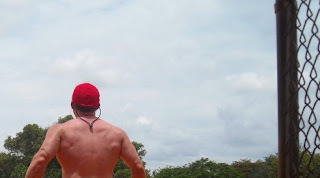 Then I thought about a day back in 1992 when I was stranded in Fort Lauderdale, shirtless and shoe-less on the hottest day of the year and had to make my way on foot 15 miles across the city. Add in some inspiration from one of my favorite films "Falling Down", a homage John Jake's "Brak the Barbarian" novels, some personal backstory (yes there is a love interest) and an autobiographical pulp action thriller novel was born. 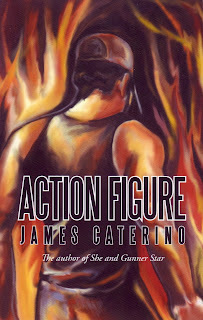 As far as the book itself...if what I wrote above and the back cover blurb piques your interest and if you are free of any heart conditions, "Action Figure" is the book for you.